From the great Nation of Canada comes one of the best Progressive Technical Death Metal bands of all time. 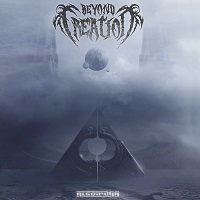 BEYOND CREATION and their third full length album “Algorythm” has set the standard for which all Prog/Tech Death Metal bands should follow. Their first album “The Aura” released in 2011, showed how much of a powerhouse they were right from the start. Three years later they released “Earthborn Evolution”, solidifying their place as a top tier Metal band. Just four years later they have graced us once again with “Algorythm”, each album bringing more depth and creativeness than the previous. In all honesty “Algorythm” is one of the top three best releases of 2018. There aren’t many bands that even come close to being able to go head to head with BEYOND CREATION. I can barely describe how amazing the Guitar work played by Simon Girard and Kevin Chartre is. The artistry put into the Guitars is the Metal equivalent of Michelangelo’s painting in the Sistine Chapel. As for the Drum work by Philippe Boucher, I would have to compare it to the magnificence of Botticelli’s painting La Mappa Dell’Inferno. The Bass played by Hugo Doyon-Karout can be compared to any of H.R. Giger’s work, dark and symmetrical. I don’t know of many bands that have the Bass right up there with the lead Guitar. Simon Girard who is also the vocalist, brings a certain harmony to the band. I don’t believe he could have done a better job because the vocals are perfect. The first track entitled “Disenthrall” is the first of three instrumentals on the album. The song which is very mysterious and brings a sense of dread and adventure, is a magnificent opening to such a distinguished album. It’s the perfect way to ease you into the second song and give you time to prepare for what’s to come. “Entre Suffrage Et Mirage” is a prime example of what I have come to love about BEYOND CREATION. The beautiful melodies mixed in with hard hitting and intricate time signatures. This one is perfect in the sense that it develops the mood setting for the rest of the album. “Surface’s Echos” has this really well written and harmonious acoustic beginning that quickly transforms into beautiful chaos. When Simon’s vocals kick in I was immediately hooked. This instantly became one of my all time favorites from them. “Ethereal Kingdom” is thoroughly somber in the beginning and even though it picks up, it keeps a melancholic feel throughout the whole song. It gave me a sense of wonderment and yearning for more. Luckily this isn’t even the halfway mark on the album. “Algorythm” is the fifth song up and this too has a depressing feel about it. The whole thing is absolutely immaculate, especially the heavier parts. I definitely rank this as one of the best songs on the album. “A Travers Le Temps Et L’Oubli” is another beautifully written instrumental that leads into the seventh song on the album. “In Adversity” is one of the heavier songs I have heard so far on the album. The solo’s on this track really make it one of the better songs on “Algorythm”. Another thing that stood out to me on this track was the vocals, which are hands down some of the best I have ever heard from the band. “The Inversion” may actually be the best song ever written by the band. I can’t even begin to put into words how absolutely incredible this song is. It has everything you could ask for and more. If you cant afford the whole album I suggest purchasing this song at least. Now you know you are pretty talented when you have not just one, not just two, but three incredible instrumentals on one album. And that is what we have as the second to last song with “Binomial Structures”. It’s six and a half minutes of some of the best musicianship I have heard in quite some time. And now we are at an end to this epic journey that is “Algorythm” with the last track entitled “The Afterlife”. This song was a really good choice for being the final song on the album, it brings the whole thing back together and has a little bit of everything in it. As I stated before this is one of the top three best albums of 2018. This is now my favorite album from BEYOND CREATION and in the top ten of my all time favorite Progressive Technical Death Metal albums. I STRONGLY ADVISE YOU TO GET THIS ALBUM IMMEDIATELY! Great job guys!